A rare insight into the legendary Paul Caffyn, who was took on challenging seakayaking expeditions years before his time. Paul has circumnavigated practically everything including Australia, New Zealand, Great Britain, Japan, and Alaska! 15 minutes. A rare insight into the legendary Paul Caffyn, who was took on challenging seakayaking expeditions years before his time. Paul has circumnavigated practically everything including Australia, New Zealand, Great Britain, Japan, and Alaska! 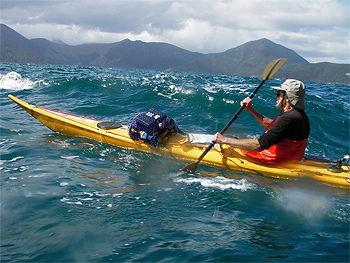 Paul talks about his trips and inspriation while paddling in New Zealand’s Marlborough Sounds & Alaska. This film has been described as 'essential viewing' for any serious seakayaker. 15 minutes. 534MB. 4 x 3.